Is this the Year the Pittsburgh Pirates Snap the Streak, or is the Collapse Imminent? We’re 93 games into the Major League Baseball regular season, and for the 3rd year in a row the Pittsburgh Pirates have a winning record. Unfortunately for Pittsburgh fans, the previous two seasons have ended with collapses, making the Pirates the first professional sports team to have 20 consecutive losing seasons. Optimists say 2013 is finally the year they snap the streak, while pessimists see another collapse coming. So which is it going to be? I’m going to use Minitab Statistical Software to analyze the statistics from the previous two seasons, and then see how they compare to this year. So just how far above .500 were each of the Pirates teams before their collapse? 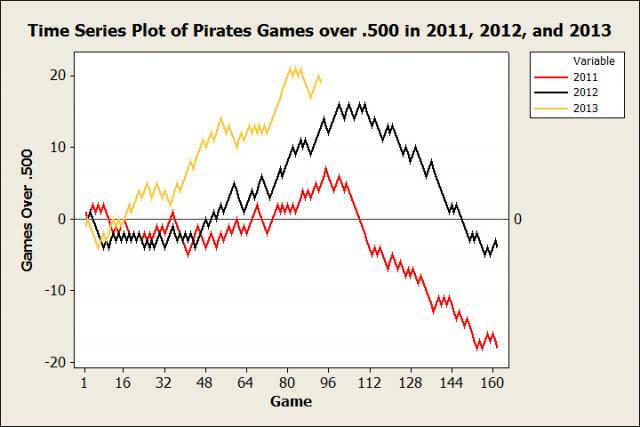 The following time series plot shows how many games the Pirates were above (or below) .500 at each game of the season. You’ll see that each season follows a similar pattern. In the first half of the season the Pirates play pretty well have a record well above .500. But then around game 100 their play and record plummet. But you’ll see that this year the Pirates are in better shape than the last two years. They are currently 19 games above .500, which is 3 games above their “high water mark” last year. But before we get to the statistics on this year, let’s look back at the last two collapses. Ninety-three games into the 2011 season, the Pirates were 5 games above .500. In order to have a winning season, they needed to get to 82 wins. That meant in their remaining 69 games, they needed to win 33 of them. So what was the probability that they would win at least 33 games? We can visualize the odds with a probability distribution plot. 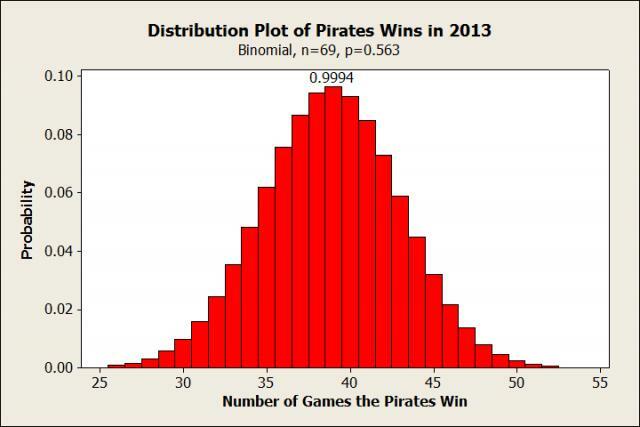 This will shows us the probability that Pirates had of winning “x” amount of games. I’m going to use a binomial distribution plot because we have discrete data that can be categorized into two events, either a success (win) or a failure (loss). All we need is a sample size and a probability. The sample size is 69, since there were 69 games remaining in the season. For the probability, I could use the Pirates winning percentage at the time. However, I’m going to use their Pythagorean expectation instead. It calculates how many games a team “should” have won based on the number of runs they've scored and the number of runs they've allowed. For example, a team that has scored 200 runs and also given up 200 runs "should" have a recrod of .500. It is a better predictor of future results than winning percentage, so it will give us a more accurate picture of how the 2011 Pirates should have performed in their final 69 games. At the time the Pirates had scored 369 runs and allowed 357, good for a Pythagorean winning percentage of .515 (their actual winning percentage was .527). 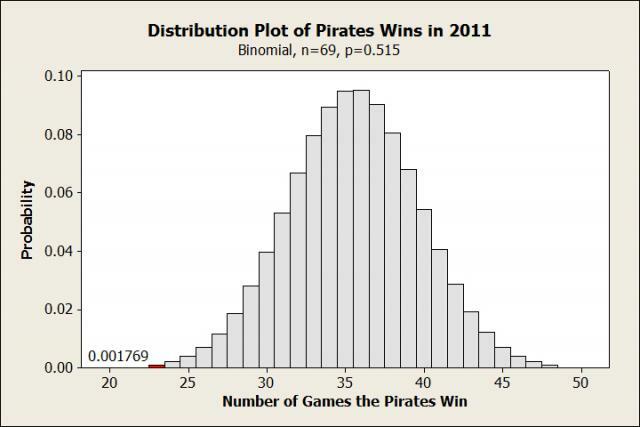 So let’s use this information to make a binomial distribution plot and see what the probability was that the Pirates would win at least 33 games. 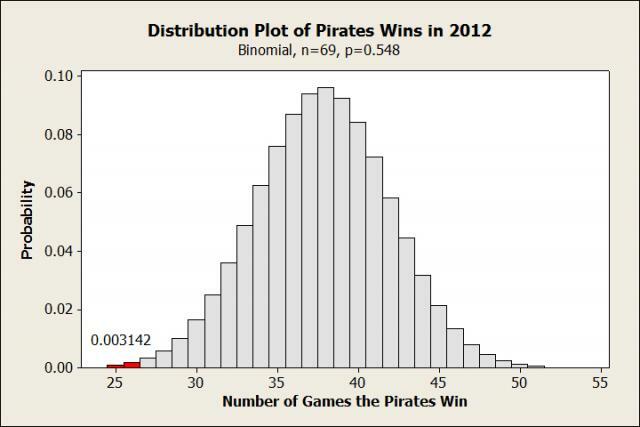 NOTE: I realize the Pirates actual probability of winning varied from game to game. But in order to meet the assumption of the binomial distribution, I'm going to assume the probability was a constant .515. The calculation won't be exact, but it's going to be close enough. So without further ado, here are the results. The red area represents all the observations where the Pirates would finish with a winning record. 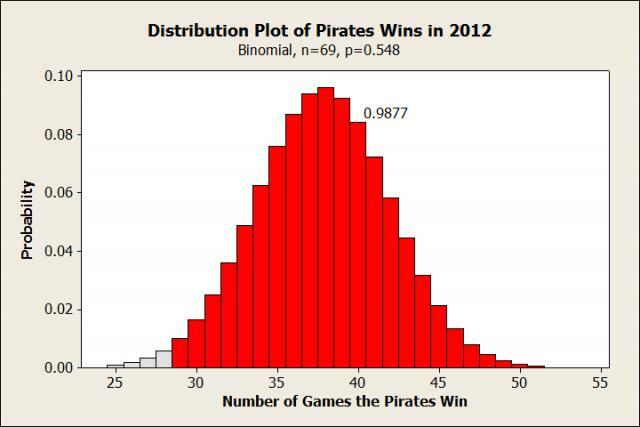 We see with 69 games left in the 2011 season, the Pirates had about a 76.77% chance of finishing with a winning record. But instead of making our plot look smart, they went on a horrid losing streak and only won 23 games the rest of the season (a winning percentage of .333). Their run differential went from +12 to -102. So let’s take the same probability plot and see what the odds were of them winning 23 or fewer games. Wow, you can barely even see the red area. The probability that the Pirates would play as poorly as they did in the last 69 games of 2011 was 0.177%, or about 1 in 565. That’s not quite in the area of the Boston Red Sox collapse in 2011, but it’s still pretty bad. Now let’s see how 2012 compares. Ninety-three games into the 2012 season, the Pirates were 13 games over .500. Their run differential was +39, giving them a Pythagorean winning percentage of .548 (their actual winning percentage was .570). They needed only 29 more wins in their last 69 games to have a winning season. So let’s see what their chances were. The Pirates looked to be in great position to break the streak at this point last year, having a 98.77% chance to win at least 29 more games. But once again, they made my plot look ridiculous by winning only 26 games the rest of the season (winning percentage of .377). Their run differential went from +39 to -23. What were the odds of their collapse this time? We’d expect the Pirates to win 26 or fewer games just 0.3142% of the time, or about 1 in 318. Not as bad as the 2011 collapse, but still extremely improbable. The odds were so small for both the 2011 and 2012 Pirates that it seems unlikely that the losing streaks happened by random chance. But there weren’t any significant injuries to either team, and both had positive run differentials prior to the collapse. So it’s hard to explain why they performed so poorly at the end of the season. Perhaps it really was just random! Now that we’ve seen what kind of collapses the Pirates are capable of, let’s see what it’s going to take for them to finish under .500 this year. The Pirates are currently 19 games over .500. A mere 26 games will get them to 82 wins. Their run differential is +46, which is good for a Pythagorean winning percentage of .563 (their actual winning percentage is .602). Let’s see what the binomial distribution plot has to say! 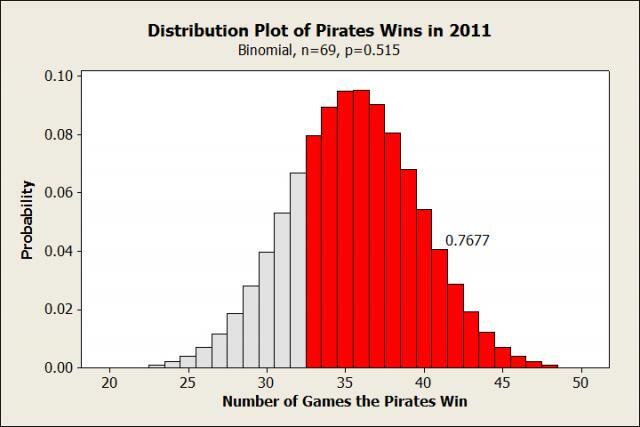 The entire plot is covered in red, and we see that the probability of the Pirates winning 26 or more games is 99.94%. That means the chance that they collapse so poorly that they don’t finish with a winning record is .06%, or about 1 in 1,667. It appears then that there is virtually no chance the Pirates can completely collapse this year and finish below .500. But the previous two seasons have shown that the Pirates are capable of unlikely losing streaks. If those were just random, then the 2013 Pirates should have nothing to worry about. But if there is something else going on, the Pirates might be in store for another late season collapse whose unlikelihood would rival the 20 year losing streak itself! So which is it going to be Pittsburgh? Finally live up to what the statistics say you should do, or continue to be a riddle wrapped in a mystery inside an enigma? I'm betting on the former, but with the Pittsburgh Pirates, you just never know!